With summer starting to heat up it’s time for families to start planning their summer vacations. This can be a stressful period, especially for families whose budgets are already stretched trying to afford their mortgage and saving for retirement. 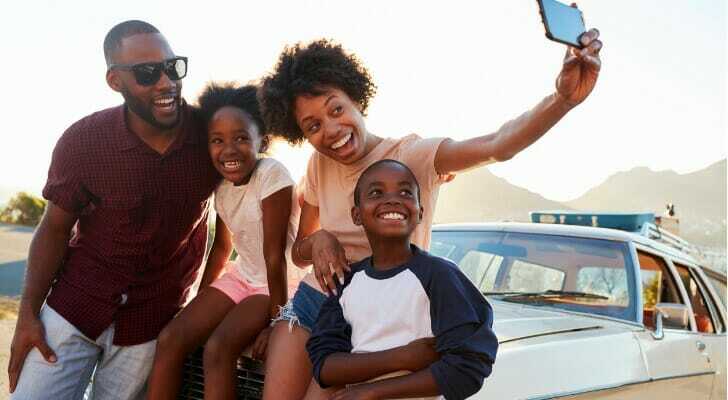 But while a dream trip to a distant country may be off the table, there are plenty of affordable U.S. destinations which families can enjoy without breaking their savings accounts. 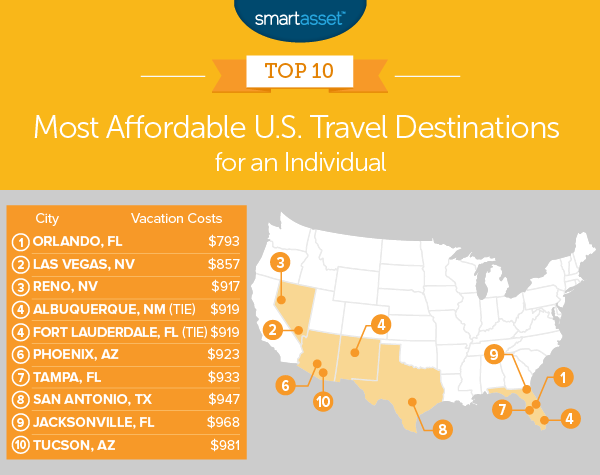 Below we rank the most affordable U.S. travel destinations. 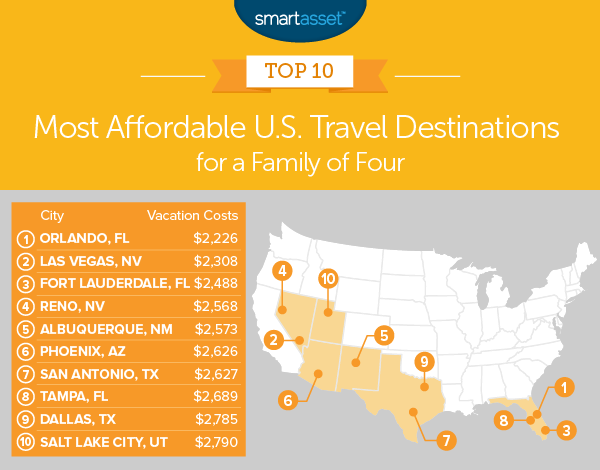 In order to find the most affordable travel destinations in the country, SmartAsset estimated the costs of a vacation for a family of four and for an individual. Specifically, we looked at the cost of hotels, flights, car rentals and meals for a family of four and an individual in 48 cities. Check out our data and methodology below to see where we got our data and how we put it together. Sunshine State – Florida has three cities in our top 15, which is more than any other states. Close competitors are Texas, Arizona and Nevada, which each have two. What is great about visiting Florida is that not only is it an affordable state, but once you’re there you don’t have to spend any extra money to enjoy the great weather. More of the same – Now that we have done this study for four years, some definite patterns are starting to emerge. For example, Orlando is a very affordable place to travel (although your budget mileage may vary depending on if you go to Disney World) and the only thing keeping you from an affordable trip to Las Vegas is your luck at the casino. Las Vegas repeats last year’s second place finish again this year. Sin City ranks so well because of the affordable flights. According to our data, the average round-trip flight to Las Vegas costs under $234. For that metric, Las Vegas ranks first. Arizona’s capital comes in sixth. As a travel destination, this city ranks in the top 10 for three out of four metrics. In total we estimate that a family of four could expect to pay $2,626 for a three-day, three-night vacation in Phoenix. The biggest hit to the family budget will be airfare. The average round-trip flight to Phoenix costs $327, according to Bureau of Transportation estimates. An individual making the same trip could expect to spend $923, on average. Of course, fans of desert environments will find Phoenix is a wonderful place to visit. Phoenix is home to the Desert Botanical Garden which has over 21,000 plants, including 139 rare, threatened or endangered species. And don’t miss the great hikes. Papago Park, Camelback Mountain and South Mountain Park are all within driving distance of downtown Phoenix. For visitors wondering what to do in San Antonio, a walk along the San Antonio River through the city is never dull. And remember, the Alamo is San Antonio’s most visited landmark and is well worth including in any trip. Salt Lake City takes the final spot. We estimate that a family of four can expect to pay $2,790 on a vacation here. That is only $5 shy of Dallas. 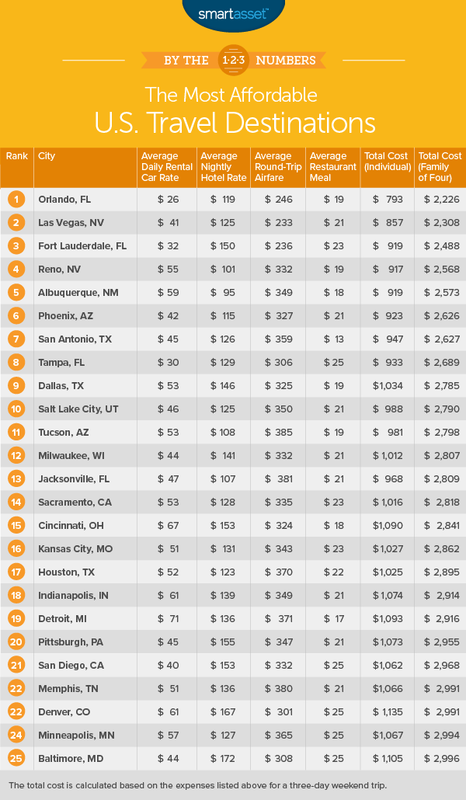 For an individual, on the other hand, Salt Lake City is actually a more affordable trip than Dallas. The reason for the disparity is the high cost of airfare to Salt Lake City. You don’t get a family discount when buying tickets and the average round-trip flight to Salt Lake City costs $350. Salt Lake City is perhaps better known as a place to visit in the winter, thanks to all the wonderful skiing. But all these hills and mountains that make Salt Lake City such a wonderful place to ski also make it a wonderful place to hike. Plus, hiking is a more budget-friendly vacation option than skiing. The reason for the disparity between this city’s family ranking and individual ranking are the expensive flights. Jacksonville ranks in the top 20 for three of our metrics, but 40th for average air fare. Those flight tickets hurt a family of four more than an individual. Average daily car rental cost. We assumed that both a family and an individual would rent a car for three days. Data on average car rental rates came from cheapcarrental.net and is for 2016. Regularly check your budget – In order to save money, you need to watch what you are spending. Creating and constantly watching a firm budget is a good way to reel in unnecessary spending. Use the right savings account – Sometimes you are budget-constrained and you can’t squeeze any more savings out of your current situation. But that doesn’t mean you can’t save more money. Have your money work for you by putting it in a high-yield savings account. Online-only banks like Ally Bank or Synchrony tend to have the highest interest rates. Force yourself not to spend it – Even if you find yourself saving money, it can be tempting to spend it if you keep it within reach. One way to force yourself not to spend money is to give it to someone else for safekeeping. That is roughly how certificates of deposits (CDs) work. With a CD you give a bank a certain amount of money and they promise to return it to you after a certain amount of time with interest. You can get your money back earlier, but you will have to pay a penalty. If you are someone who struggles to not spend money after you save it you may want to look into the best CD rates.